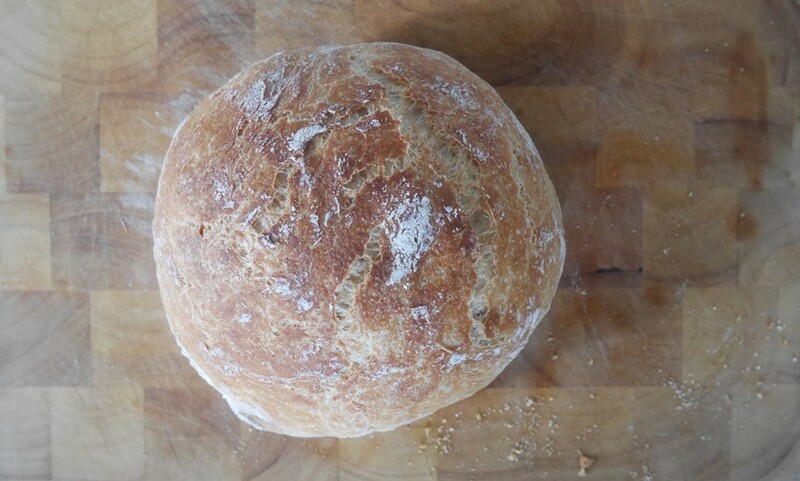 When my over-achieving friend, who is literally a ball of non-stop energy, suggested to me (with an 8 week old baby) I bake my own bread I thought he was crazy. The mixture needs to be left overnight so remember to mix the ingredients the night before you want to get baking. Into a large bowl add the flour, yeast and salt. With a spoon slowly mix in the water until it forms a scraggy ball of dough. (You may not need to use all the water to get to this point.) Then simply cover with clingfilm and leave overnight on the kitchen counter to do it’s thing. The next day you’ll find more of a bubbly mixture that has risen nicely. Preheat your oven to 230C and pop your pot into the oven without the lid on. Whilst that’s happening, flour a surface and your hands and pull the mixture out of the bowl. It’s a bit sticky but should come out as one big lump. Use floured hands the round the dough and cover with clingfilm for 30 mins while the pot heats in the oven. Then just plop the dough into the pot, cover with a lid and bake in the over for 30 minutes. After that time take the lid off and keep in the oven for a further 8–10 mins to give the loaf a nice brown colour. Then hey-presto! it’s ready, carefully take the loaf out, it should sound hollow when you tap the base, and cool on a rack. Wait at least 15 mins then it’s ready to slice and slather with butter and jam for a treat, dunk in olive oil and balsamic, or serve with soup or a casserole. SCRUMPTIOUS.